How to Use Mister Smith’s Letter Recognition Program in a Kindergarten Classroom. A solid amount of kindergarten students will enter knowing a good amount of their letters and this is great. This will quickly allow them to participate and integrate themselves into the classroom curriculum very easily. As a teacher. This is what we want. As a teacher. This is not always what we get. We all know that we have a few students that will enter with only a handful of letters or no letters at all. This is where my Letter Recognition Program can be of the greatest help. Another good thing to do early in the kindergarten year is read to the class the “Mister Smith’s Alphabet Book”. This will help introduce the concepts of the flashcards to the entire class. The students that already know all of their letters will still enjoy the book and the students that don’t know their letters will begin to look at the uppercase letters in a different light. Once you have established a group of “struggling learners” then we need to start introducing the flashcards to them. Ideally the kindergarten teacher will have help for at least a small portion of the day and these students can be worked with individually. I know that this is not possible in many classrooms and I would then suggest working with the Letter Recognition Program in small groups. I suggest 2 times a day for 10-15 min per student if possible, but one time a day will work. You can potentially send home the flashcards and have their caregiver work on them at home but this is not necessary. The flashcards come with guidelines and the directions of how to teach each letter are on the back of each individual card. I would suggest that you read through the guidelines and read all of the teachings on the backs of the cards so that you are familiar with the concepts. Most students find the process of learning in this way very enjoyable and really enjoy being successful and building upon that success. 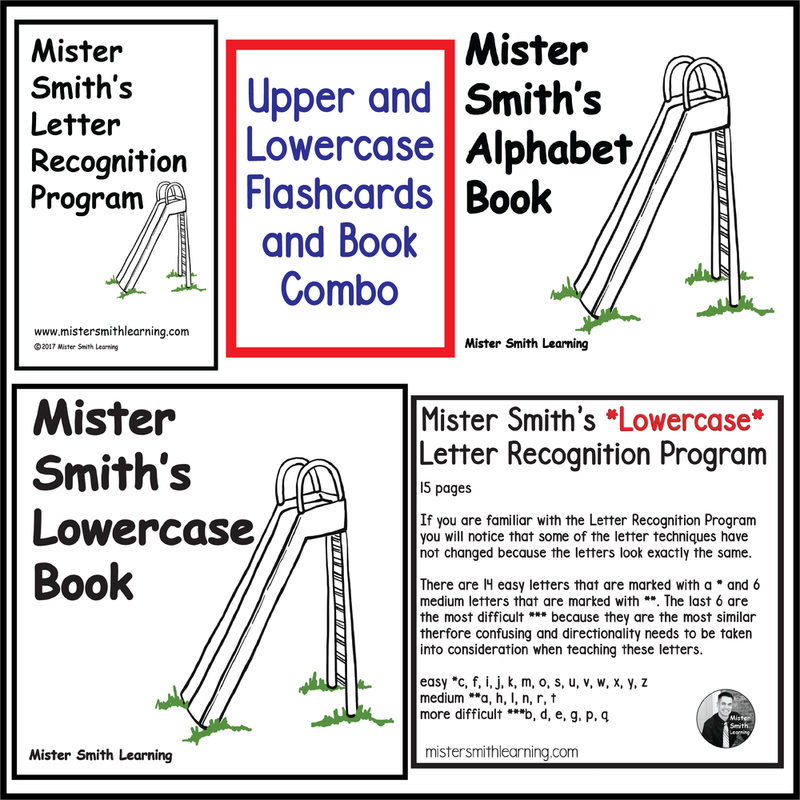 Mister Smith's Lowercase Letter Recognition Program can be used next. This will teach your students how to look at the "tricky" letters and start recognizing them easily. This will really help prepare them for the next step, learning their sounds with Mister Smith's Sound Cards. It is important that you keep good data on your students because you don’t need to re-teach letters that the student already knows and it helps to to help streamline the process and focus on the letters they need to work on the most. We have Mister Smith Name Cards which can be useful to help reinforce the concepts to the students at their desk. We also have uppercase letter wall posters which can be hung up in the classroom. We have had tremendous success with many struggling learners. If you have a few students struggling, this approach is worth a shot. I know that having a class full of strong learners and one or two struggling....those one or two can take up a very large portion of your headspace and this program can help you begin to make progress with those students. Thank you for listening. I hope you found this helpful.